WordPress is powerful, indisputable, most advance platform to built a creative innovative websites. Its beautiful finest modern look always surprise and attract the users. WordPress based websites are most in demand because they are pain free, easy set up, limitless customization and many other exciting features especially its awesome plugins like WooCommerce, Nextgen, and the most popular jQuery masonry plugin. These features and plugins makes your website more adorable, outstanding and eye catching. These free masonry WordPress themes help your blog to standout and attract the users easily. jQuery masonry plugin is flawless, exemplary to exhibit your work in grid form. Masonry is very easy and elegant way to give your website a clean unique look. Important and most prestige websites like Pinterest uses masonry layout. Pinterest was the first website which uses masonry layout. 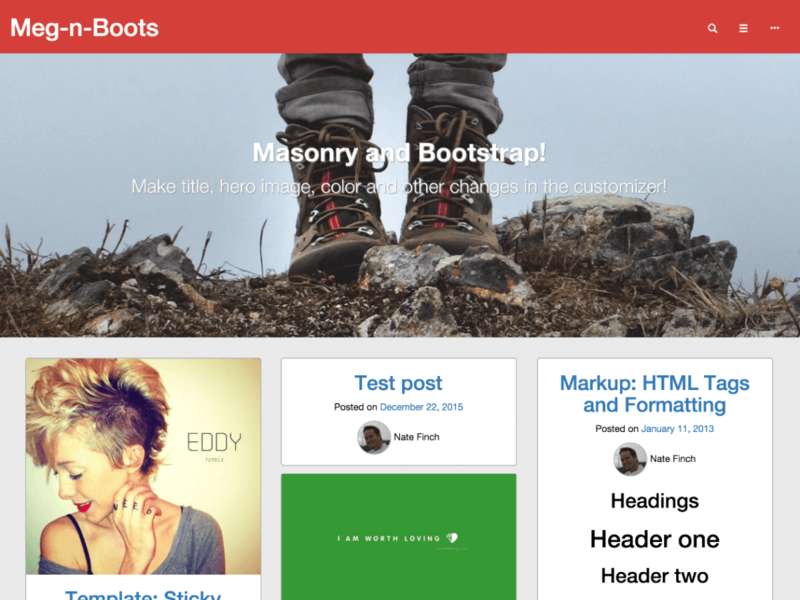 Thats why masonry layout can be mention and speak of Pinterest style layout. Masonry is a column based gird layout that give your website really different look. Masonry layout has not predefined hight rows and column. It also help decreasing extra gap in web page. Now a days in a web design world masonry layout is the most favourite choice of web developers. In Masonry layout you can built design creative blogs, dashing portfolio modest WordPress theme. I research and pick out for you some magnificent masonry theme. Now its time to showcase my selection of masonry free wordPress theme. 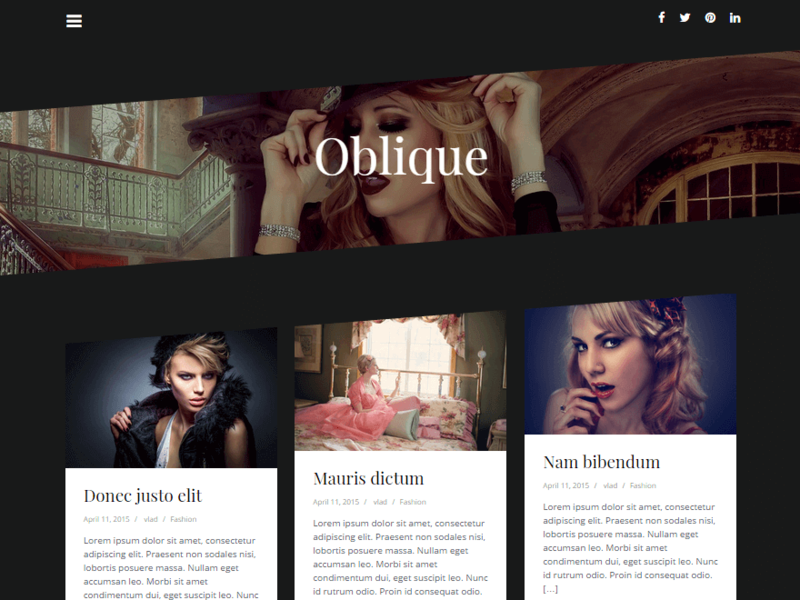 Oblique is unique, attractive, aesthetically appealing free masonry WordPress theme. It is masterfully crafted, well-built, polished and beautiful theme. Its professional and imagination look strike the user easily. It is clean and user friendly theme. It is vibrant and dynamic multipurpose theme which can be suitable in blogs, photography, personal, fitness, health, travel, agencies, small business websites. It has marvellous parallax header image which supports fashion blogging more impressively. It is completely responsive theme. It is major browser compatible. It has sliding sidebar navigation also. some other dazzling hot features are translation ready, customisable typography, custom menu, custom header. 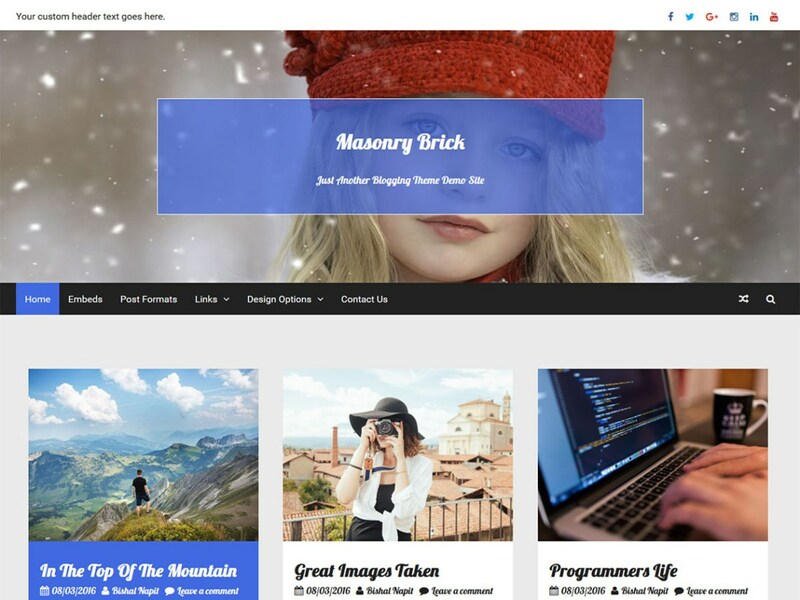 Masonry Brick is a unique impressive free WordPress theme. It is professional and highly customisable WordPress theme. It is clean, modern and awesome theme. Its name clearly shows as it is grid based theme. It is perfect theme to showcase your outstanding work. Its creative masonry layout attract the user easily. It can be fit in photography, fitness, travel, tours, wedding planners, fashion, personal, portfolio, blogs, start up business websites. It has some elegant feature which make it different to other. It is completely responsive theme. As it polished and well crafted theme. It has also some wonderful advance features such as custom background, translation ready, custom header, two column, post format and many other also. 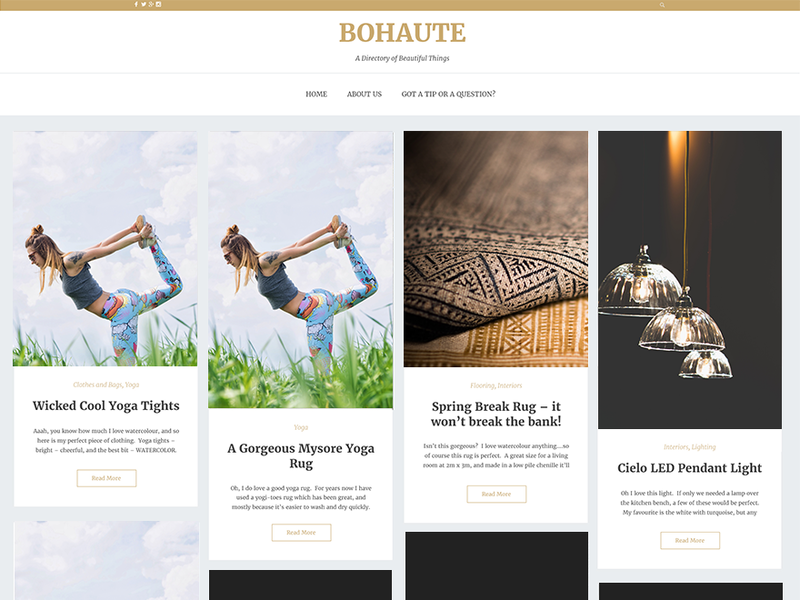 Bohaute is a modern beautiful free masonry WordPress theme. It has clean and fresh look. It is well built and well design masonry theme. Its masonry layout stand out the content in a pleasant way. It is multipurpose theme. But it is perfect for creative people, photographer, agencies, fashion designer, portfolio. Its homepage has a admirable masonry layout which can help to make your blog more awesome. It has post templates and static pages that helps to give more interest on your video, image and text content. Although it has limited customization option but you can built nice website and logo also. This marvellous product has also dazzling features. Its also support micro-formats and translation ready. 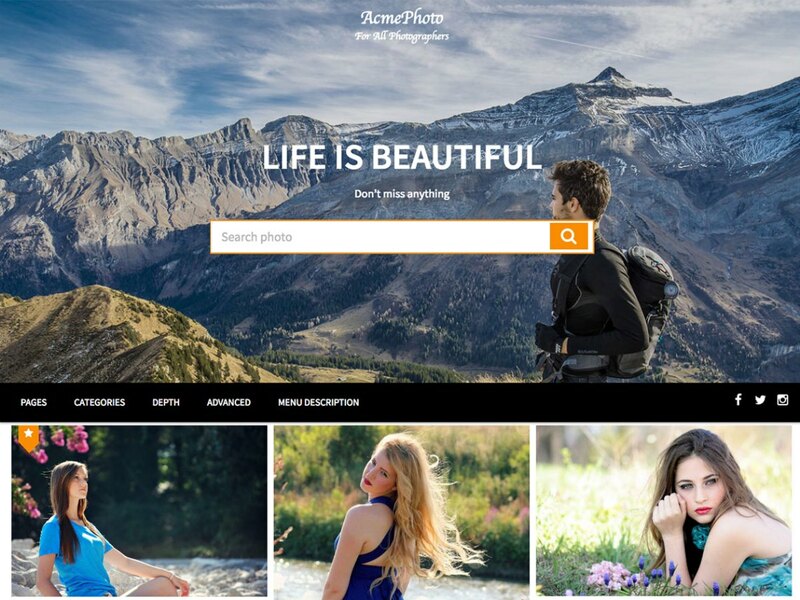 AcmePhoto is a beautiful, elegant and clean free masonry WordPress theme. It is well developed, crafted smooth theme. It is grid based layout theme. This creative theme is perfect choice for creative agencies, portfolio, bloggers, and typical photography. It is refined, seamless theme is easy to use. It has bundle of functionality and professional features in zero price. It is highly responsive theme and SEO friendly. It has breadcrumb option, you can enable/disable it easily. It support latest major browsers and social media. Other exciting features are multiple menu position, custom CSS, translation ready, header option, search placeholder. 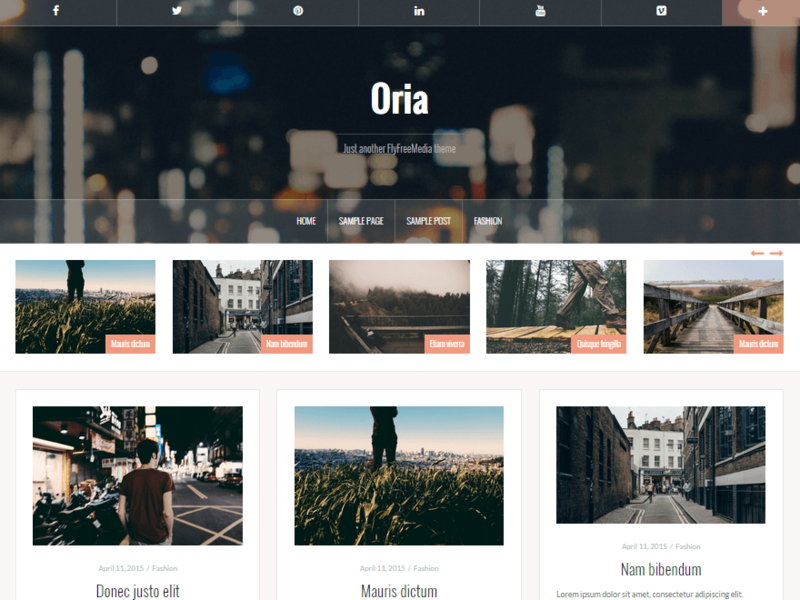 Oria is a awesome, polished minimalist free masonry WordPress theme. It is breathtaking eye catching theme that impress the user easily. It is well-built, well designed masonry layout good looking theme. It is a creative, versatile, flexible, multipurpose theme. It can easily fit in different blogs, fashion, travel, wedding, photography, health, fitness, small start up business websites. It is completely responsive theme. It is compatible at all other devices. This theme support social media, feature slider and full width header. Google font can be easily access in it. It also has some other nice features such as translation ready, parallax header image and many more. 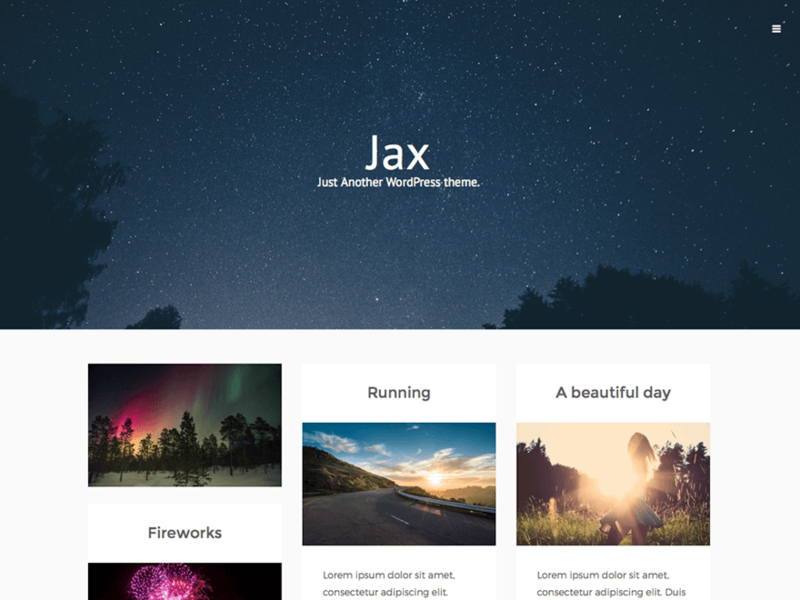 Jax Lite is a modern purposeful free masonry WordPress theme. It is creative, neat and clean theme. It has beautiful look which impress the users easily. It has refined masonry layout style that help to display your amazing content and photograph extremely impressive manner. It is minimalist effective and completely responsive WordPress theme. It is multipurpose theme and appropriate for agencies, small business, wedding, travel, photography, fashion, fitness, gym, personal blogs and websites. It support CSS3, major browser and HTML5. Some other outstanding features are translation ready, sidebar widget ready and post format. 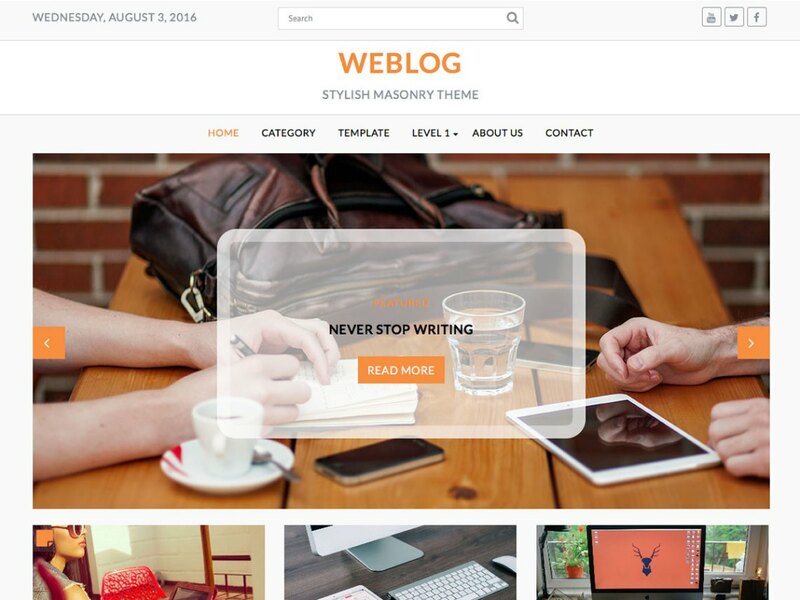 Weblog is a beautiful, modest free masonry WordPress theme. It is refined grid style layout theme. It is professionally designed, well built smooth theme. It is highly versatile multipurpose theme that can be fits in multi-concept blogs, magazine and personal and corporate websites. It is highly responsive theme and it can be compatible in any device. It is adaptable, SEO friendly and easy to use theme. It support custom CSS and social media integration. It has many premium quality impression option like breadcrumb, logo, date display, footer, header. It has also excellent feature like search placeholder, advanced custom widgets and many more. 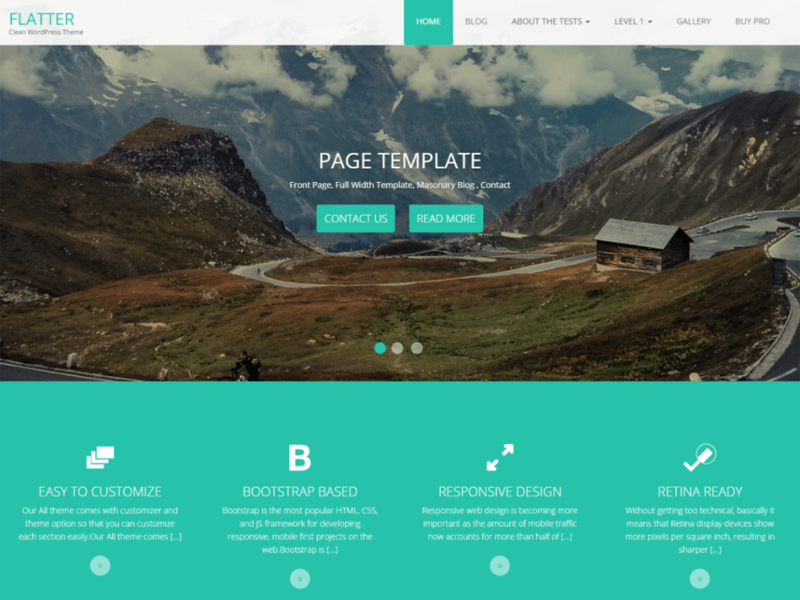 Flatter is fantastic, modest free masonry WordPress theme. It is elegant, neat and clean grid layout based theme. It is well designed, well developed and thoughtfully constructed theme. It is full loaded multipurpose theme and can be felicitous in fashion, health, travel, photography, fitness, blogs, magazines, small business and corporate websites. Its awesome look catch users focus. It is fully responsive theme. It has wooCommerce ready and translation ready. It has fixed menu with beautiful animations. It has useful built in plugin to enhance the functionality. It support semantic markup. It has also many other features like full width template, RTL language, left sidebar and many more. 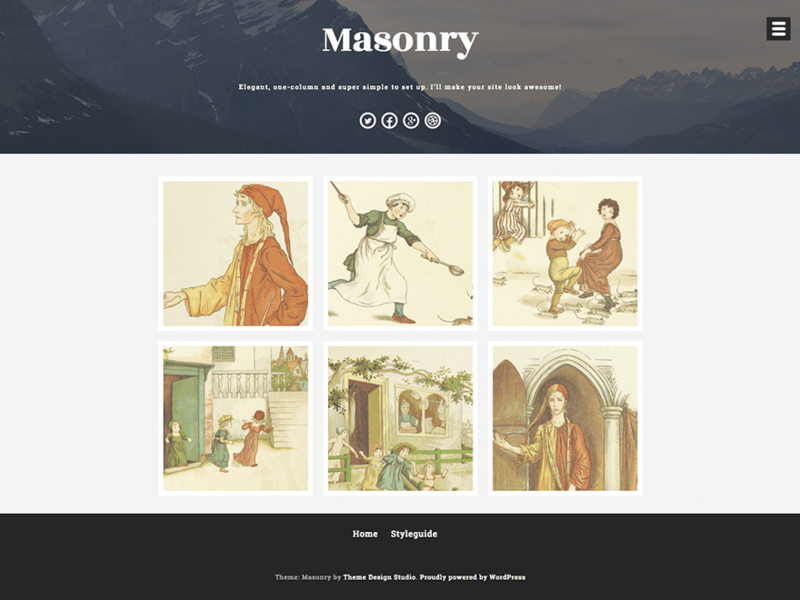 Masonry is a delicate vibrant and dynamic free WordPress theme. As its name clearly shows that it is masonry layout theme with beautifully grid placing. It is fantastic, thoughtfully designed multipurpose theme. It is ideal for developers, bloggers, creative agencies, fashion industries and of course for professional photographer. It has well organized and clean look attract the viewers easily. It has premium quality features in zero price. It is built in mobile-first design techniques so completely responsive theme that can be compatible in any device. It has also some outstanding features like social icons, excellent custom header, custom menu, featured images and lots more.